Another weekend of glorious weather. I decided to make an early start on Sunday and try a slightly more ambitious Wainwrights On The Air (WOTA) activation than normal. The plan was to walk over Barrow and Outerside and, if my legs still had enough energy left in them, Causey Pike. Though a much easier walk than those undertaken by Phil, G4OBK, I haven't done much hill walking since getting married nearly 8 years ago and am not as fit as I used to be. This would be the longest walk I'd done for a long time. I set off in the warm sunshine at about 9.30 and after about 15 minutes heard "CQ WOTA" from Phil who had arrived on the summit of Dodd, the other side of Bassenthwaite Lake. I was afraid I might have missed him while I was on the road. His expected arrival had been an hour earlier and I'd waited to try to catch him from the home station. But the day was warming up and he might have had a change of plan so I decided I couldn't wait any longer. Dodd was a new summit worked for me so I was glad to have caught him. It also meant that Phil's effort hadn't been in vain because Dodd is a difficult hill to get contacts on. The path I was taking passed along the flank of Barrow. To reach the summit I would have to backtrack on a higher path. On the map it didn't look far but in reality it looked quite a long walk so I decided to get Barrow on the way back and started the climb to Outerside. It was a pleasant and not difficult climb, but sweaty work in the growing heat. Eventually I reached the top (first picture) from where I made several contacts on 2m using the telescopic 5/8 wave antenna, including another with Phil G4OBK/P who had by now reached Carl Side. I was not inclined to hang around on the summit which was plagued with flying ants - as were all the Lakeland summits judging by the comments of other hill-toppers. I descended the other side of the hill and made my way back to the main path from where I saw a track up the side of Causey Pike which looked like a shortcut. I crossed the path and made my way to the track, where I sat down and ate my packed lunch as there were no insects in that area. 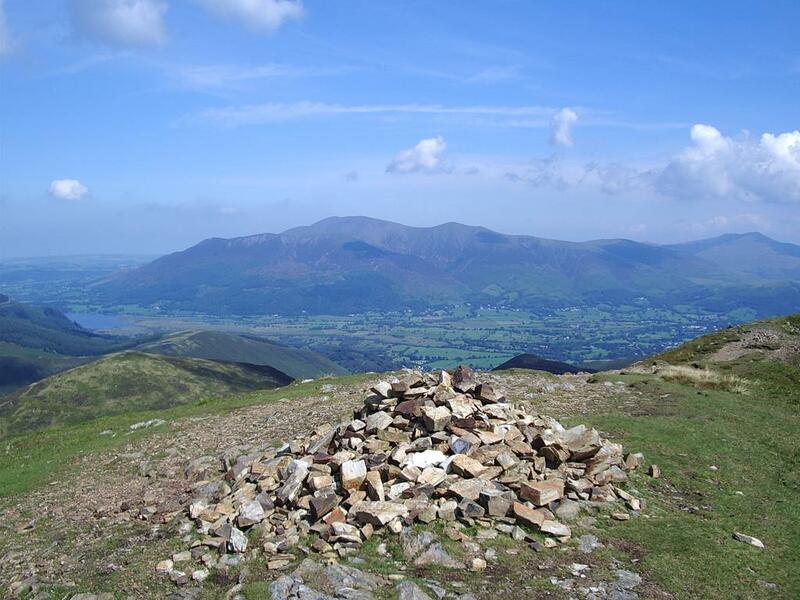 Causey Pike is a narrow ridge with several undulations along its length. In fact I seem to remember one walkers guide I read a few years ago referring to it as Causey Pikes. My Ordnance Survey map shows it as a long, narrow island surrounded by the 2,000 foot contour (it's an old map, made before they went metric.) 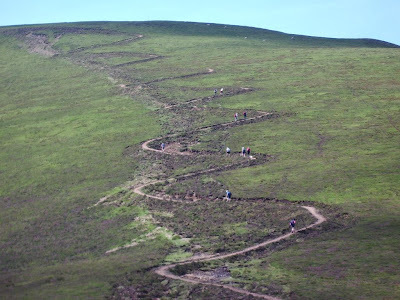 I have walked along it several times over the years since I first came to the area but I had never given much thought to exactly which of the undulations was the actual summit was because at the time it didn't matter. The shortcut looked too short to reach 2,000 feet. I set off, and after about 15 minutes reached the crest. From there it didn't look like 2,000 feet either. To my left, after a few more feet of climbing, was a small plateau which was followed by a sharp descent into the valley. To my right, the crest of the ridge rose steadily for what looked like another 400 or 500 feet. "The summit must be up that way" I thought, so I turned right and off I went. On the way I stopped to work Ian, 2E0EDX/P on Brim Fell, for another summit that I wouldn't have worked from home. Eventually I arrived at the highest point which was surmounted by a rough stone cairn. I started to call "CQ WOTA" and made several contacts from what I described as the summit of Causey Pike, including one with Colin, 2E0XSD whom I asked to check whether my position was showing on aprs.fi. He confirmed that it was, and the details tallied with what my VX-8GR GPS was showing. 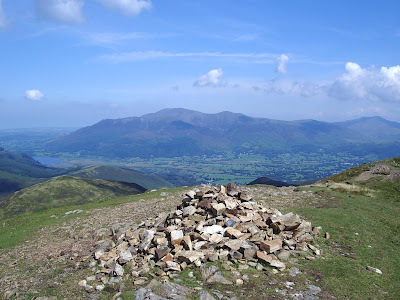 I started to make my way off the fell on my way home by the main footpath when I was called by Phil, G4OBK, to pass on a message that Colin didn't think I was on Causey Pike when I made the contacts. Since Colin sometimes has a bit of fun at my expense due to an error I made during an earlier activation the thought crossed my mind that he was having a wind-up. 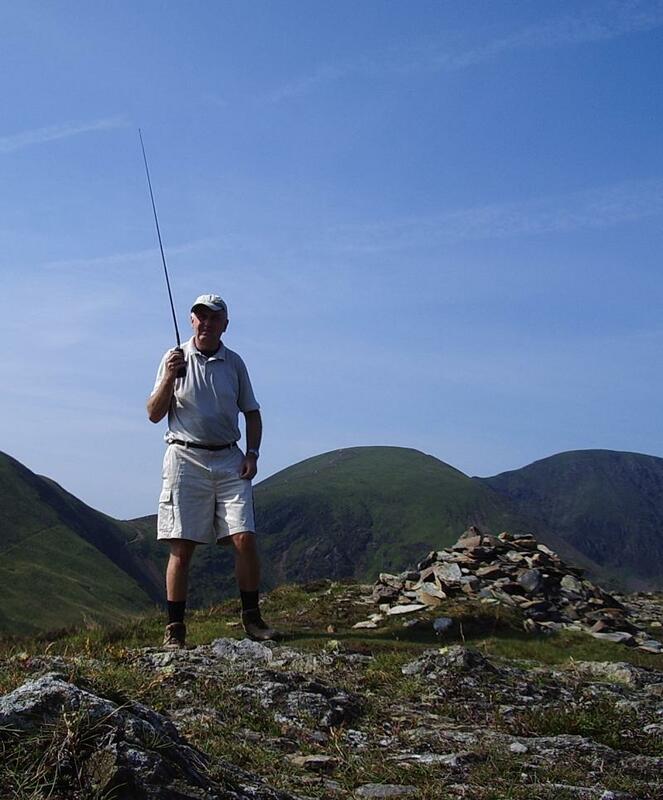 Shortly after that I received an APRS message from Colin which stated that I was on Scar Crags, not Causey Pike. I had never heard of Scar Crags but I knew that there was another hill nearby called something Crags (having checked it is Ard Crags) so I thought that perhaps the position of the labels on the map may have caused Colin to mistake my position and decided to carry on descending. While all this was going on I was watching a couple of mountain bikers zooming down a zig-zag path that had been made on the side of the fell named Sail opposite where I was standing. 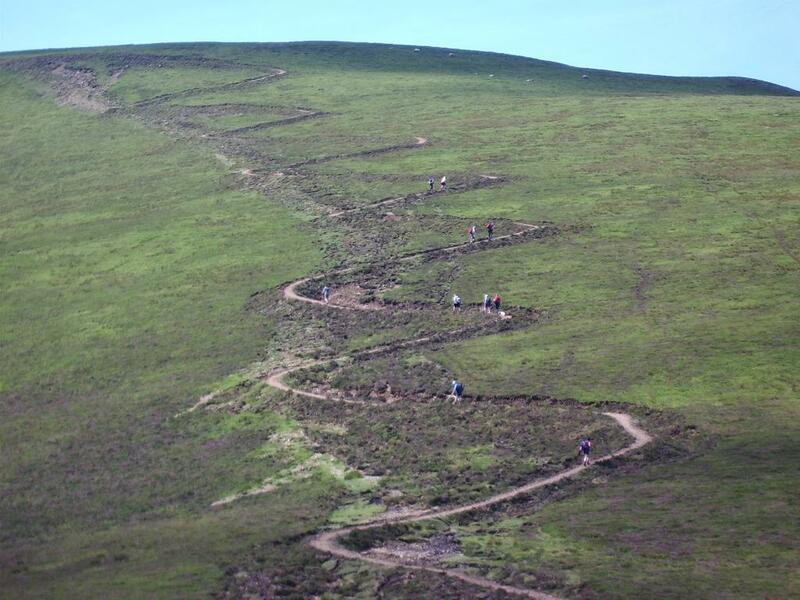 This unsightly path has been made because the number of boots (and presumably tyres) ascending and descending the fell had destroyed the original path and made it dangerous. Britain is an overcrowded island and the number of visitors, particularly in recent years as more people take holidays at home, is literally causing the hills to wear out! Further down the path back to the car the surface had been repaired by tipping truckloads of small rocks into the channel caused by thousands of boots, so that instead of a gentle walk down I had to pick my way from rock to rock like on a rocky beach. Not a particularly welcome activity for legs that were becoming tired. The battery of my VX-8GR finally expired during a contact with a SOTA summiteer in Northumberland whose call I heard on the walk down, so there being no point in taking the loop over Barrow I walked straight back to the car and came home. Back home, examination of my position report on aprs.fi showed that Colin had been right. I had indeed been on Scar Crags when making my "Causey Pike" contacts. It's rather embarrassing to make such a public mistake, as well as frustrating to have missed the opportunity to activate the real Causey Pike. I will just have to try again one day. And next time, perhaps I'll also activate Barrow. Isn't APRS wonderful? Reminds me of the time I was tracking through Oklahoma City on my way to visit a client. I missed a turn and immediately knew that I'd hear about it from them. As soon as I walked in the door their opening remark was "missed the turn, huh?". Yes, with tracking enabled, your every move is subject to public comment, mostly in the ridicule class!